(CN) – Asia’s rapidly shrinking high-mountain glaciers are flowing at a slower pace due to widespread ice loss, jeopardizing freshwater availability for downstream countries like India, Pakistan and China, NASA researchers said Thursday. Asia’s mountain glaciers move from the frigid peaks of the world’s tallest mountain ranges down to warmer climate zones where melting ice feeds major rivers such as the Yangtze in China and the Indus, which flows through India and Pakistan. The advance or retreat of glaciers in the region provides a critical view of changes in Earth’s climate since it contains one of the highest concentrations of snow and glaciers outside of the polar regions. Scientists researching how melting glaciers will contribute to the region’s water resources and sea level rise have found it difficult to observe glaciers from the ground – due to their huge geographic expanse and inaccessibility – so they’ve relied on analysis of satellite images. The international study released Thursday used satellite images to examine the speed and regularity of water flowing down mountains containing melting glaciers. If glaciers melt too rapidly, they can pose downstream hazards such as glacial lake outburst floods and landslides. Satellite data over the last decade show glaciers lost ice mass as their top surfaces melted at increasingly higher rates. An algorithm developed in part by Dehecq analyzed close to 2 million satellite images from 1985 to 2017 by tracking how far distinctive spots on the glaciers like crevasses or patches of dirt traveled over time. The algorithm found the velocity of glaciers’ movements changed by a rate of 3 feet per year, said Dehecq’s colleague and study co-author Alex Gardner. Researchers also concluded that 94 percent of the differences in flow rates of water from ice melt could be explained by changes in ice thickness. In the few locations where glaciers have been stable or are thickening rather than thinning, the study found flow speeds also have been increasing slightly. “What’s surprising about this study is that the relationship between thinning and flow speed is so consistent,” said coauthor Noel Gourmelen of the University of Edinburgh in Scotland. As gravity pulls on a glacier’s mass, it slides on its base in a slow movement caused by ice crystals slipping past one another under the pressure of the glacier’s weight. When the glacier thins and loses mass, sliding can become more difficult and the glacier’s flow slows as a result. Water lubricating the glacier’s base can also make it slide more easily. Asia’s mountain glacier region stretches from the Tien Shan and Hindu Kush mountains in the northwest, to the eastern Himalaya range in the southeast. 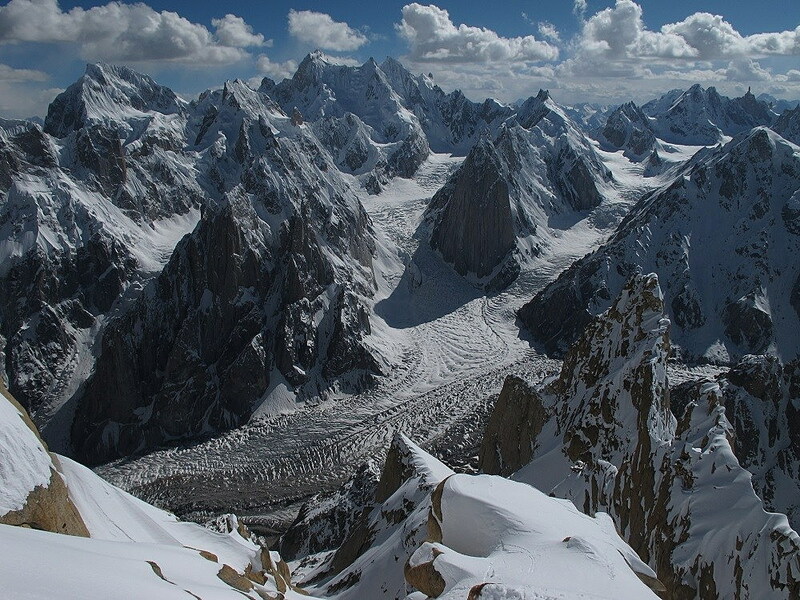 After decades of observing satellite images of glaciers, such as the Baltoro Glacier in the Karakoram Range in Pakistan, researchers believe a third of the region’s glacial ice could be lost by the end of the century if climate change is not curbed.